Day 1 and after the opening by the Prime Minister and a shot gun start, the weather was good to us today (well, at least to me given the restrictions on distance). 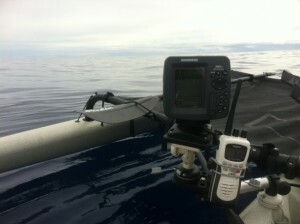 This morning I set out and reached the 1000 foot drop off due north of Apia fishing a few decent reefs along the way. 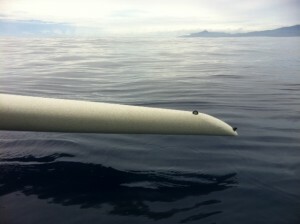 Flying fish, sea turtles and air borne manta rays and mackerels were some of natures highlights. I returned to weigh in with nothing to offer, but had one huge hook-up at 11:42am on the edge of a reef (the reef came up to 80 foot). As the Shimano Tiagra screemed, I lost the chance of setting the hooks by choosing to crawl to the bow and furl the sail first – lesson one, set the hooks first. This fish kept spooling 50lb mono and the proof is in the Rapala x-rap brand new last night and covered in tooth marks now, guessing a big Wahoo or Mack. Weigh in for the big boys and the star was a 300lb+ Blue Marlin. Late afternoon and I copped the edge wind of a storm and clocked 10 knots on the Hobie and really enjoyed giving the legs a break after the glassy morning. 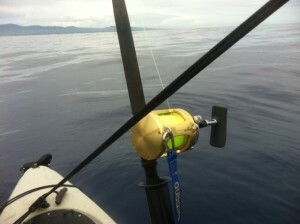 Covered 25kms today, found an awesome reef with fish all over the sounder, survived the first day and ready for tomorrow…. 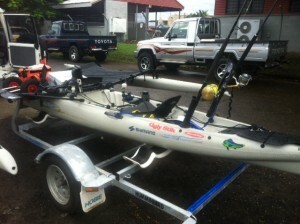 Pics and footage to follow in the next few days, and the return of the Hobie Adventure Island to the weigh station certainly turned a few heads – I’m pretty sure I’ll get a good fish, but today I was reminded just how quickly the ocean can change. 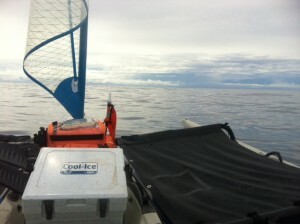 One minute I was eating lunch while sailing on glassy waters, and ten minutes later the swell picked up and 30 knot gusts appeared out of nowhere.